Dr. Weber trained at Memorial Sloan-Kettering Cancer Center, with dual fellowships in surgical oncology and hepatobiliary. She specializes in benign and malignant disorders of the liver, pancreas and bile duct in addition to gastric cancer, melanoma and sarcoma. Dr. Weber is actively involved in minimally-invasive approaches to cancer treatment, including both laparoscopic pancreas and liver surgery. She has been invited as a speaker/moderator at many national meetings, including the American College of Surgeons, the American Heptaopancreaticobiliary Association, Society of Surgical Oncology and Society of University Surgeons. 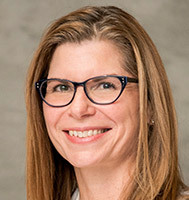 She is the Tim and MaryAnn McKenzie Chair of Surgical Oncology, Director for Surgical Oncology, UW Carbone Cancer Center, Vice Chair, General Surgery and Professor. Dr. Weber conducts translational research at the UW Carbone Cancer Center, evaluating novel tumor selective agents which may be promising for imaging and/or treating tumors. She also conducts clinical research evaluating prognosticators of outcome in patients with liver, bile duct and liver tumors and investigates new imaging agents in pancreas and liver cancers. In addition, her lab is evaluating ways to target anti-cancer medications more specifically to the cancer cell by targeting the cellular mechanism of the cancer.